Back in the 1990's I was co-owner of an herb store in Denver. Besides the store, we also had a retail mail order and wholesale business for our herbal products. We use to make our own catalogs and go to the local office supply store to print them out on their copy machine. Many nights we would sit around a table and fold and staple these catalogs together. I thought of this fun but, tedious time when I was surfing a website called PsPrint. 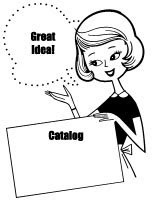 Seeing these nice glossy catalogs that you can so easily order made me laugh at how primitive our catalogs now looked. I think that if I were running that business now, there would be a lot of things that I would do differently. I would definitely offer something much more attractive and professional like the PsPrint catalogs.